Blink-182, the punk pop favorites of a generation, are back with their highly anticipated seventh studio album, California, set for release July 1, 2016 on BMG. The tour, promoted by Live Nation, will kick off on Friday, July 22 in San Diego, Cali. at the Viejas Arena and take the band to over 50 cities throughout the U.S. and Canada. Since their humble beginnings twenty-four years ago, when they started playing in a San Diego garage, ‘blink-182’ has sold over fifty million albums worldwide and rocked audiences from Adelaide to Zurich having become one of the defining rock bands of their generation. They combine high-energy dynamics with an artistic ambition that transcends any genre. 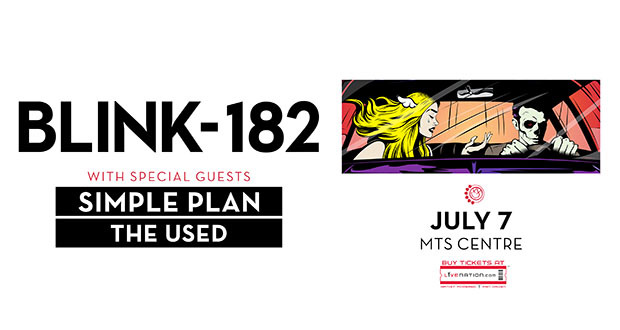 Now with Matt Skiba (of Alkaline Trio) joining ‘blink-182’ as singer/guitarist, the group starts a new chapter. Skiba debuted with ‘blink-182’ in March 2015 with a live performance at the MusInk Tattoo and Music Festival: “It was the best they’ve sounded in over a decade,” the OC Weekly raved about the band’s set.